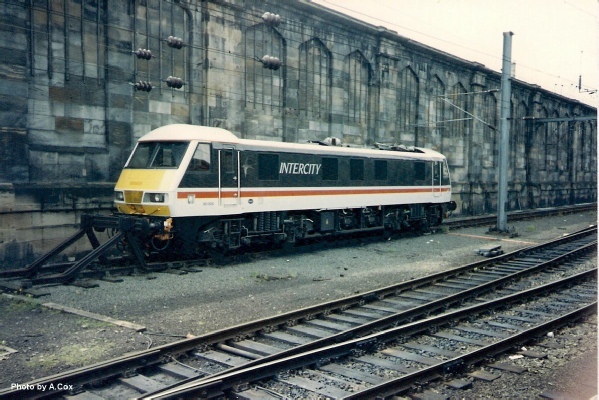 This loco started her career in late the 1980s on the West Coast for the then Intercity and latterly Virgin Trains.In this particular picture, the 90 has been captured at stabled at Carlisle when new. She was in the area at the time on driver training and familiarisation. In glorious sunshine and nameless, 90004 pauses at Manningtree with the 11:30 service from London Liverpool Street to Norwich (1p24). Interestingly this loco was named 6wks after this shot was taken. This shot was taken at Colchester a few days after the class 90 was named working a service from London to Norwich. The focus point of this picture has been to depict the new blue shiny nameplate. Owing to engineering work mainline services between London & Norwich were starting and terminating at Shenfield. This is 90004 on the 12:33 from Shenfield to Norwich pausing at Ingatestone. Standing at Diss in cloudy conditions, 90004 has been captured topping a DVT after it had failed. The train in question is the 13:30 from London Liverpool Street (1p28) and 90012 was on the other end of the set. A few days after being named “Eastern Daily Press” 90004 has been pictured looking rather clean and sporting her blue new nameplate at Colchester with an express service from London to Norwich. On a bitter cold winters morning with fresh snow on the ground albeit just a dusting, 90004 can be seen arriving at Diss with an Intercity service from Norwich bound for London.